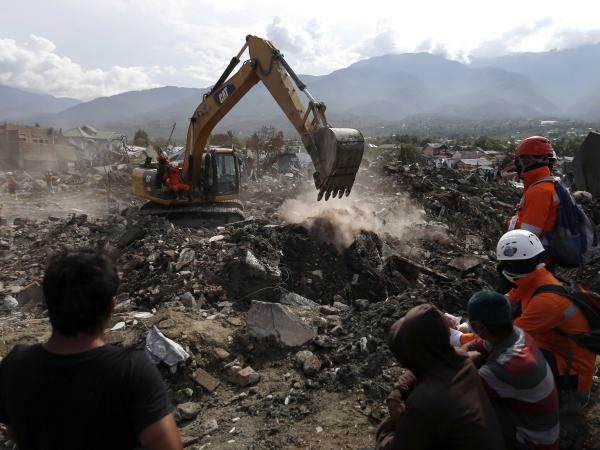 Rescue workers watch as a heavy machine dig through rubble searching for earthquake victims on Thursday in Palu, Central Sulawesi, Indonesia. Indonesia is winding down its search and rescue operations, with thousands of people believed to be still missing after a devastating earthquake and tsunami struck last month on the island of Sulawesi. The official death toll for the disasters stands at 2,073. 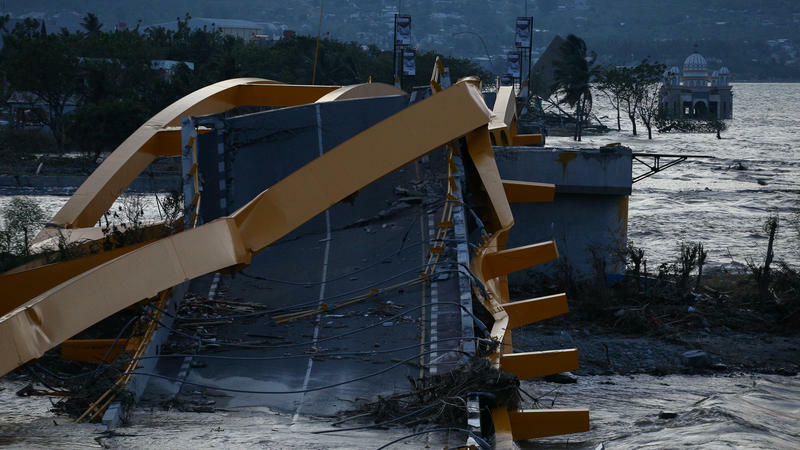 But the national disaster agency says that the number of those still missing could be as high as 5,000, after the strength of the quake caused the ground to liquefy and swallow up buildings and people. Search efforts had been set to end Thursday, but were extended to Friday. "Because of the demands of the residents to lengthen the search for victims, we have extended the search and evacuation process for one day," said national disaster agency spokesman Sutopo Purwo Nugroho, according to The Associated Press. There are prayers set to take place in hard-hit areas, the wire service added, as search efforts continue. The rescue efforts are winding down due to fears about the spread of disease, Reuters reported. "Heavy equipment hasn't been able to operate in neighborhoods where the earth turned to mud, hampering the search effort, and many bodies have decomposed beyond recognition due to the tropical heat," AP reported. The death toll has steadily risen since the double disaster hit on Sept. 28. NPR's Julie McCarthy recently visited the neighborhood of Petobo, where " the ground has a wobbly consistency — not quite jello — that is anything but solid," and "in the air, is the pungent scent of dead bodies." There, she says, major portions of the area have been destroyed. Homes were swept away by liquefaction — as McCarthy describes, it's caused by "soil mixing with water to create a quicksand effect." In nearby Balaroa on Thursday, relatives of the missing stood waiting for news as rescue crews searched through debris. "I don't have any tears left, all I want is to find them," 43-year-old Ahmad, a farmer, told Reuters. He said his wife and two daughters are missing. Rescue workers are trying to warn families that it's unlikely anyone will be found alive now. "We hope the families understand that there's very little hope at this point," search volunteer Hadrianos Poliamar told Reuters. "At the same time, if they ask us to help, if they're pointing 'please look here, my family is under here', of course, we can't say 'no', we have to dig. We want to help as many as we can." Many of the missing are children. And the children that survived are likely to have trouble returning to normalcy — according to Save the Children, more than 2,700 schools were "severely damaged or destroyed in the disaster." That's going to impact at least 180,000 kids, according to the aid organization. It's likely that many of the dead will never be found, and the true toll of the disasters will never be known. According to The Guardian, Indonesia's disaster agency is planning to clear some of the worst-hit areas and turn them into memorials and parks. The number of people confirmed killed after a tsunami and earthquake in Indonesia rose dramatically to 844 on Monday, Indonesian authorities said. Officials warned that the number of people killed could even reach into the thousands as rescuers reach more affected areas. 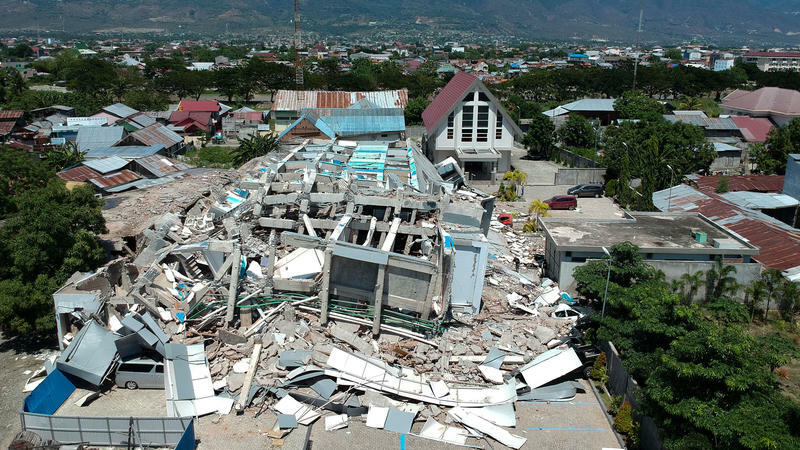 A 7.5 magnitude earthquake triggered an unexpected tsunami in the Indonesian island of Sulawesi Friday, leaving hospitals and rescuers struggling to respond.